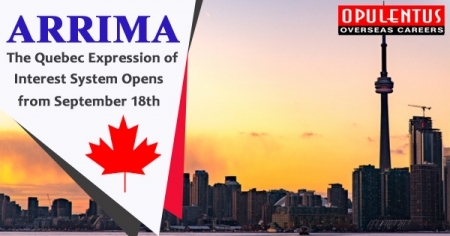 The immigration authorities of Quebec announced the opening of their fresh system for skilled workers through the Expressing Interest, named ‘Arrima’, from September 18th 2018. The Department of Immigration, of the province has developed the system as a tool of management. Moreover, it will help to maintain an uninterrupted flow of top skilled workers who have a profile, which meets the necessities of businesses. Furthermore, Arrima, is similar to the federal EE system in its working style. It also has an EOI Bank, exclusively for such candidates, who seek skilled worker immigration. Candidates need to submit an E.O.I., and enter into a pool in which the high scoring profiles receive an I.T.A for a Quebec Certificate of Selection, in the Q.S.W.P. The new rules will replace the present Time based service system. Additionally, it will also reduce the processing time for applicants to less than 12 months. Finally, there will be a priority to skilled workers who can meet the requirements of the local labor market. Candidates submit the EOI Profile online, to the Quebec Immigration, Ministry. After this, the Profiles enter a pool, where they get a relative rank. A profile has the validity of 12-months. Furthermore, the top ranks receive an ITA for a Quebec Certificate of Selection in the Q.S.W.P. The province has a plan of holding periodic draws, and invites interested candidates to apply for a C.S.Q. Such Candidates, who get the invitation, need to submit a full application, in 90 days. Upon receiving the approval, the candidates who receive a nomination certificate (CSQ), can apply and seek permanent residence in Canada. For the Candidates many factors like education, age, work experience, language proficiency and time of residence in Quebec are important. Moreover, a valid job offer, and the qualifications of spouse/partner also get consideration. Finally, the province publishes the lists regarding top Demand Occupations and Training areas that are important in the assessment. At Opulentus, we guide the aspirants in these matters.